To illustrate the fundamentals of an airborne frequency domain EM survey, provide a vision for how it is applied in the field, and demonstrate potential uses. Fig. 181 RESOLVE system (courtesy CGG). 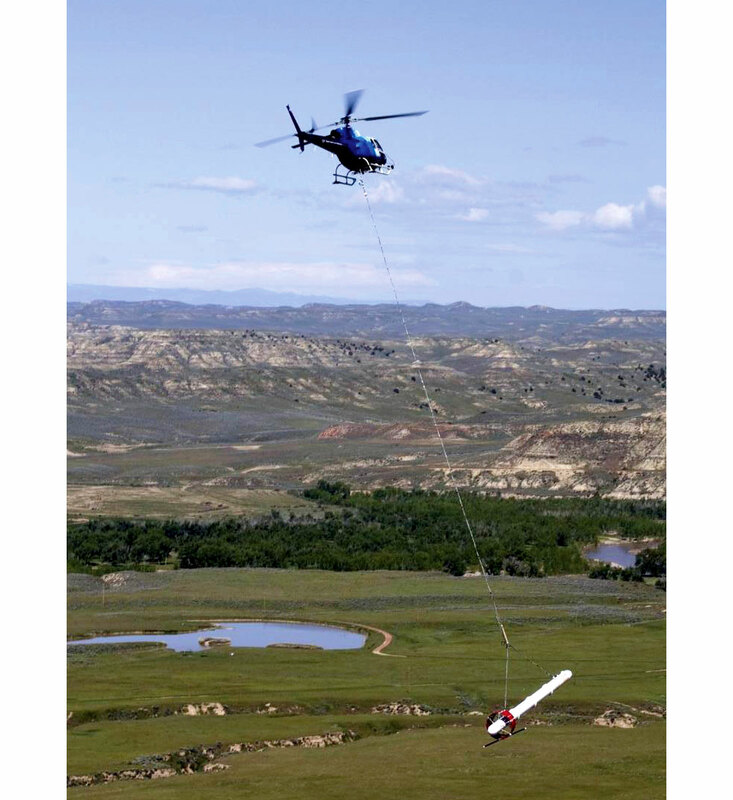 Airborne FDEM is a technology that has been proven effective in applications from geological mapping to near-surface characterization, and from groundwater assessment to mineral/petroleum exploration. A typical airborne system consists of the aircraft, either a fixed-wing or a helicopter, and the towed instrument “bird” as shown in Fig. 181 for an airborne system called RESOLVE (a commercial product of CGG). Inside the bird are multiple pairs of transmitter-receiver coils. The transmitter carries a harmonic current with a particular frequency; receiver coil measures a response that can be used to extract information about the electrical conductivity, and in some cases, magnetic permeability. Mounting coils on an aircraft, an airborne system can quickly probe the earth’s conductivity over large areas. As a result, it is particularly suitable for cost-effective regional reconnaissance and other situations where surface access is difficult. Compared to ground-based surveys, airborne EM may have a higher level of noise due to the power limitation and the rapid movement of the platform, which in general limits its depth penetration.